Why use interactives? National Air and Space Museum visitors say they want to “experience” spaceflight and to learn what “it’s really like.” This gallery aims to respond to that yearning to participate in spaceflight while earthbound. IMAX films have given millions of viewers the virtual experience of spaceflight. 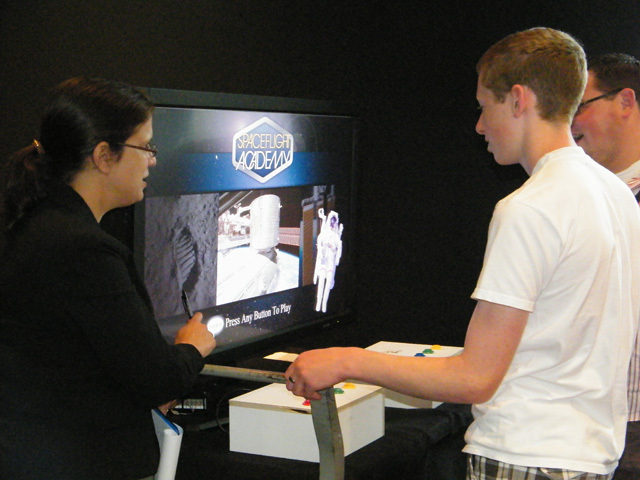 Interactives offer visitors a more participatory experience. By engaging in role-playing activities based on solid educational content, people of all ages can simulate for a few minutes “what it’s really like” and at the same time increase their knowledge of the realities of human spaceflight. The interactives have been thoughtfully designed to connect directly to the artifacts and narrative content in the exhibition now and as it develops further. Although programmed to play like games, interactives are an integral part of the museum’s effort to appeal to different ages, interests and learning styles and to complement the more traditional elements of the exhibition. SpaceFlight Academy—Visitors put themselves to the test, like new astronaut candidates do, to see if they are ready for spaceflight. Astronaut candidates spend a year learning the basics about the space shuttle, space station, space history and space science. Visitors learn new facts about spaceflight in a group quiz game to see if they qualify as a trainee, a rookie or flight ready. Be a Flight Director—Much of the action during a space mission takes place on the ground, in and around Mission Control. The Flight Director heads a team of experts that helps astronauts carry out their missions. The key to mission success is effective teamwork. Visitors consult their team, make decisions and solve problems as if they are the Flight Director for an actual space shuttle mission scenario. Space for You?—Visitors answer five simple questions about their interests to see how they match actual jobs in the spaceflight workforce. It is surprising how many careers are possible beyond astronaut or engineer. Design It!—This TouchTable activity mimics actual space-station planning, when elaborate concepts were envisioned, revised and sometimes abandoned. Visitors choose a new space-station module from those prior possibilities and equip it as they wish, then they compare the space station they and other visitors have created to the actual International Space Station model overhead. International Space Station—Here visitors can visually fly around the International Space Station in all directions, zoom on parts of interest, watch the assembly sequence and learn where the station is on its orbital path. Google Earth Station (or Liquid Galaxy)—Earth is well explored from space, and the moon and Mars beckon within the range of human spaceflight. This globe enables virtual exploration of Earth’s own and neighboring worlds. Enjoy an explorer’s eye view of the Earth, moon and Mars as if from a spacecraft approaching these worlds. Visitors can study the plains, craters, valleys, dry seas and mountains of the moon and Mars just as Earth has been studied, and find the six sites where humans have already landed and sites where people may someday return to the moon. Where have robots roamed on Mars, and where might people want to land? Robots in Space—NASA has already begun to use robots in space and expects they will help humans to reach exciting new heights in space exploration in the future. Visitors can interact with one such robot from the ARM Project by giving it simple commands and discover how robots can be useful to astronauts in space.